I love this app. I used to google every number that I didn’t recognize and then block the number in my contact list which was very time consuming. Now all of these scammers and robocalls are being captured, documented and I don’t have to do anything! 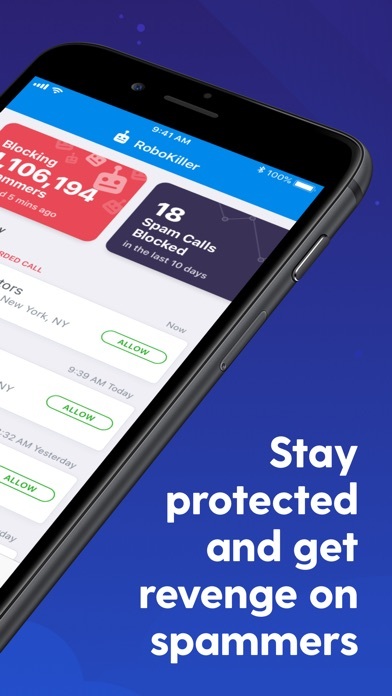 Everyone should hurry and purchase this very inexpensive application and rest assured that they can have some piece of mind that you will no longer be bothered by these irritating phone calls! I was thrilled with RoboKiller at first. It gave me my freedom back from all these dam bots that kept calling to harass me. But lately something has slipped and the bots have come back with a vengeance. I hope RK regains its lead in this arms race again soon. There’s a reason it’s called ROBOKILLER!!! 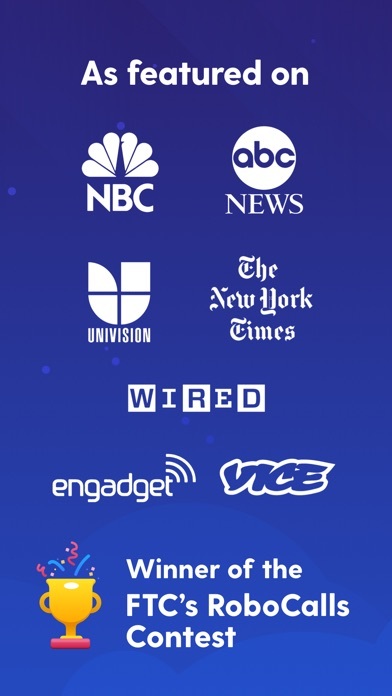 Fabulous app with a sense of humor. The prerecorded replies to telemarketers is hysterical. It is worth every penny. 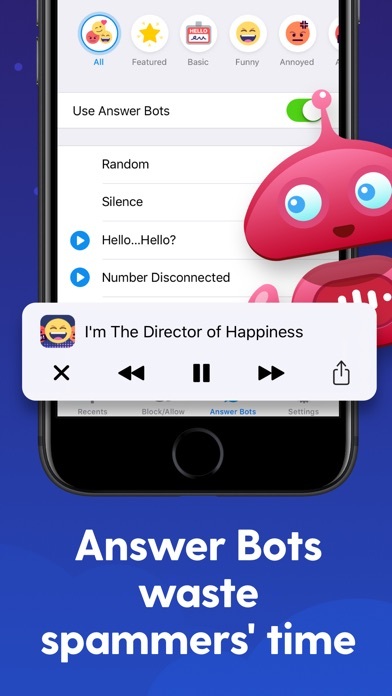 Spam calls dropped to almost zero within a few weeks of installation, and I love the answer bots! App worked great during free trial period, then started declining during the first week of my paid subscription. 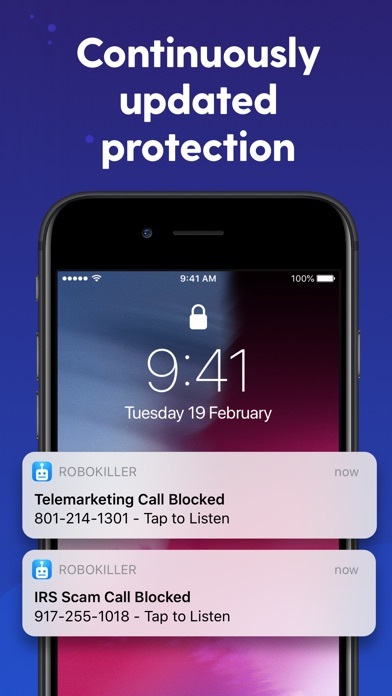 I was now blocking 10-24 calls per day myself and robokiller was getting about three. Two weeks later the app doesn't work at all. Somehow the robokiller -2 setting turned itself off and I can't get to the bots and messages page. Followed the instrux to delete app, turn phone off/on, reinstsll, etc in the order they said. Tried four times over two days. I'm spending way too much time on this app and I'm doing all the blocking work. Nevermind. I'll just do it myself. And the "chat"? Never works. "Can't connect". Good bye robokiller. I get spam calls all the time. 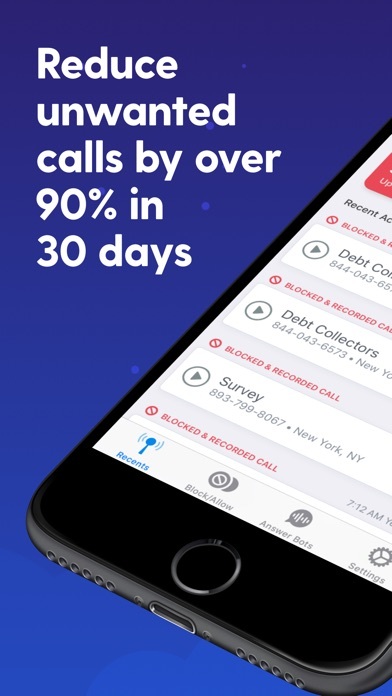 I tried this out and at the end of the free trial, not one spam call was blocked, and I still received spam calls. 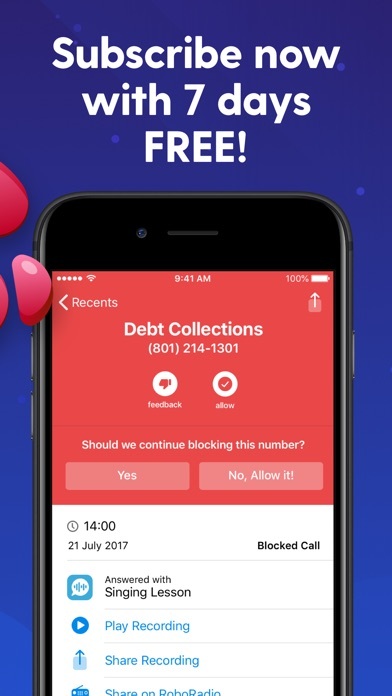 I was also not able to tell the app to block the numbers that would call me. If it worked, it would be an instant 5 stars. Great idea, poor execution. Love it and tell everyone I meet to get it.